Check out the new content patch for PlanetSide 2 live now! 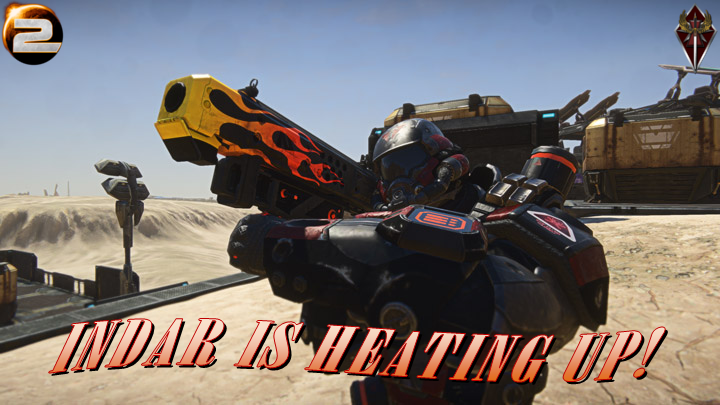 Major updates include sweeping changes to Indar, new Heatwave weapons, and new cosmetics. Major updates to the continent of Indar focus on improving combat flow in and around many bases, as well as increase the overall flexibility of the lattice. The central three bases, Ceres Hydroponics, TI Alloys, and The Crown are among the handful that have received massive revisions. The war is heating up! The new Heatwave Weapons are on fire, sporting hot-rod inspired flames for the soldier who always wants to be in the center of the action. Along with the previously released Ravenous series, the Heatwave weapons will advance a new Mayhem Weapons Directive. New from Nanite Systems, the NS-45 Pilot is a compact, three-round burst sidearm that packs a punch in close quarters. A special “Brass” variant of this pistol can also be found in the Mayhem Weapons Directive tree. Doku’s coveted Zealot Armor set hits the Depot for the Vanu Sovereignty. Stalk your prey and become the nightmare of your enemies with these technologically superior designs. Check out the patch notes for full details. PlanetSide 2 is a supported game in our Battle Division and offers all BWC members a great opportunity for quality gaming, team building and event participation. Featuring tactical variety, fun and engaging gameplay mixed with competitive elements, PS2 espouses the “One Team, One Fight” ethos that BWC centers itself upon perfectly. Learn more about the 2017 "One Team One Fight" (OTOF) Campaign HERE. This is a Totally EPIC OP Announcement! Gather round all you star ship aces and galactic juggernauts to participate in these TOTALLY most EPIC squadron battles this side of the Milky Way. It is time to bring the pain to all inhabitants of the Star Citizen Universe in a pub stomping beat down that only a mother would be proud of. This most EPIC of opportunities will commence August 4-6 2017. So grab your Hello Kitty Hornet or your TOTALLY modified Dragon Ball Gladius and stomp some pubs TONIGHT! Matches must be done with at least one other BWC member. All participates must utilize TeamSpeak. Other information that may be given out will go through the RCO. BWC is not liable for anyone loosing their minds by having to much of an awesome time. Ships will not be reimbursed by BWC. This is a non paid advertisement by BWC. All information is copyrighted by BWC and it's affiliates.Feel free to keep reading. How does your eyes feel now? Almost done. Your Totally loving this! You can earn the ribbon by submitting 4 screenshots of your scoreboard within the BWC Star Citizen Forum. You can earn the medal by submitting 8 screenshots of you scoreboard within the BWC Star Citizen Forum. Totally Awesome Words from our Sponsor! Star Citizen is a supported game in our Conquest Division and offers all BWC members a great opportunity for quality gaming, team building and event participation. Featuring tactical variety, fun and engaging gameplay mixed with competitive elements, Star Citizen espouses the “One Team, One Fight” ethos that BWC centers itself upon perfectly. Learn more about the 2017 "One Team One Fight" (OTOF) Campaign​​​​​​​ HERE. All times are GMT-5. This page was generated at 01:09.